The journal publishes original research papers at a high scientific level in the area of theoretical computer science and its applications. 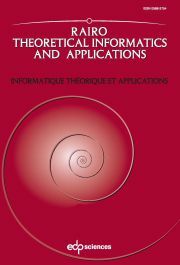 Theoretical computer science is understood in its broadest sense and comprises in particular the following areas: automata and formal languages, game theory, rewriting systems, design and analysis of algorithms, complexity theory, quantum computation, concurrent, distributed, parallel computations, verification of programs, “logic” and compilers, computational geometry and graphics on computers, cryptography, combinatorics on words. This list is not supposed to be exhaustive and the editorial board will promote new fields of research that will be worked out in the future.